Yesterday I asked you to guess the treat I was planning on sharing with you today. The answer is BISCUITS, the whole wheat variety. When we go home for a weekend or the holidays, Mr. Smith and I, love to go to one of our favorite BREAKFAST spots with our family (Hi family who read the lil bloggie, love you!) and when our friends come along (Hi friends from home, miss you too!). We go to a FAMILY owned restaurant that does a big breakfast business. It is well worth the wait for one of their meals. 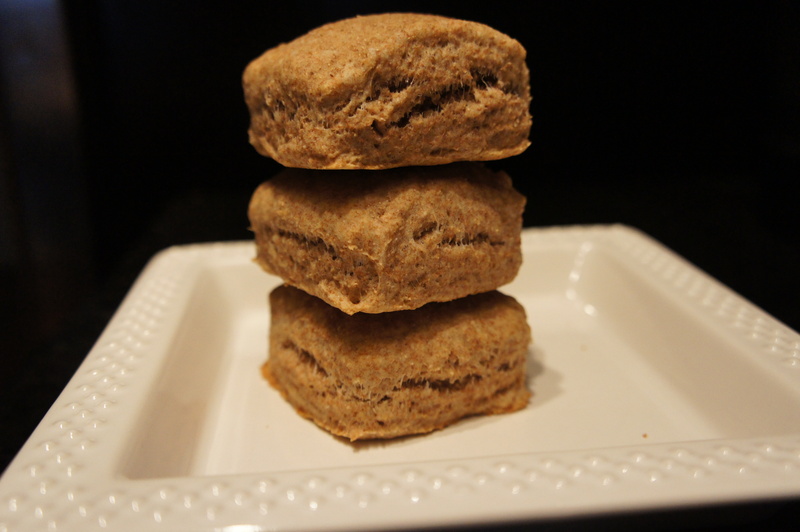 A lovely addition they serve with their meals is a tall, fluffy, square, WHOLE WHEAT BISCUIT. So in an attempt to create these lovely MORSELS while in another city, I came up with these little monsters. I scoured many biscuit recipes and had a few (cough, cough) failed attempts. Whisk the flour, salt, baking powder, baking soda, and sugar together in a large bowl. Then cut the butter into small pieces and add to bowl. Mix these together with your whisk or if you have some fancy schmancy pastry tool (I know they exist but I don’t have any and they turn out great anyway!) Once combined slowly stir in buttermilk. (Or you can pour in quickly, but if you splash buttermilk on yourself and smell like buttermilk, yuck, well don’t call me I said slowly friends!) Then roll out on a countertop or cutting board that has been lightly covered in flour. Roll out to a square shape about 1/2 inch thick. Then fold into thirds. Lightly dust each fold with flour. Repeat folds 2 or 3 times. OR if you don’t want to create the folds, knead the dough lightly a few times. Then cut out biscuits in your shape of choice. I created square biscuits in trying to replicate the nostalgia of the ones from home. But a circle works just fine. I create them about 3/4 inch thick. The recipe should create 10-12 large, fluffy biscuits. Cook for 12 minutes at 400. NOTES: You can substitute table salt if you do not have sea salt on hand. You can also substitute the whole wheat flour for all-purpose flour if you prefer. (I do love the wheat though.) I do NOT recommend using milk instead of the buttermilk. You can serve these BEAUTIES with honey, butter, jam, sausage, egg or add them to your dinner. They are quite versatile. Finally, I would like to EXPRESS a sincere sorry to my thighs for the trial runs of making of this recipe.You are welcome mouth and taste buds!